MRC Community Exchange Sarah Phoenix Community Exchange Development Officer. 2 Project Overview Start date: March 2013. Sarah was employed for 1 day/week during March, thereafter 18 hours/week, to co-ordinate & manage this project. 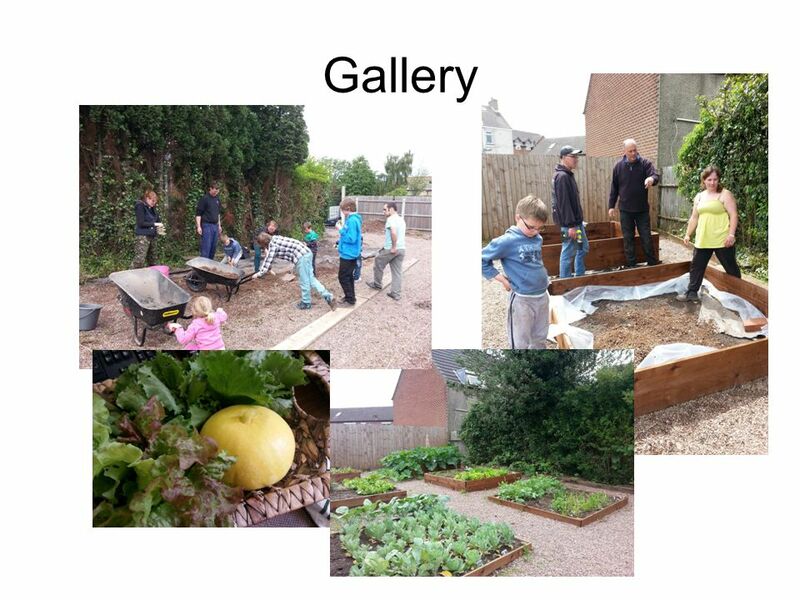 Project is based at Marlene Reid Centre, Coalville. Due to insurance reasons, activities can only happen in the building & grounds of the MRC Centre. 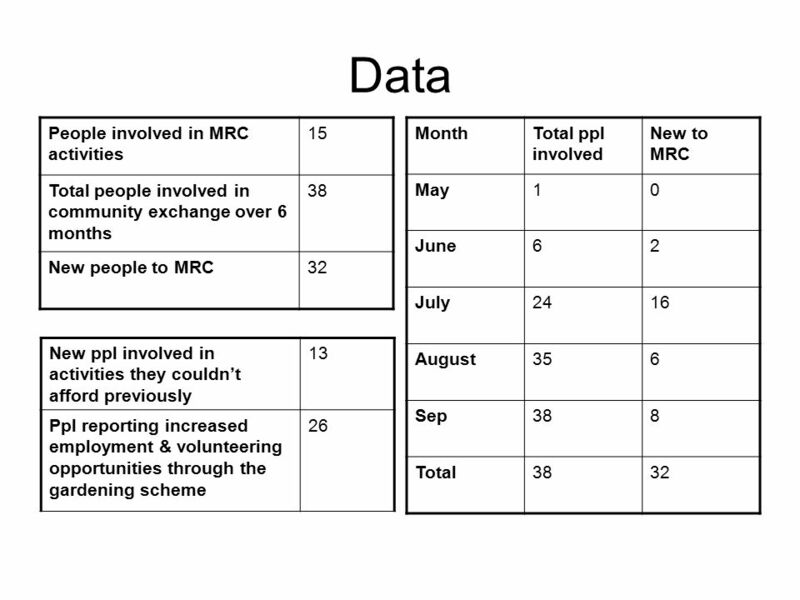 Innovation idea: Community Exchange, similar to TimeBanking. Where people can exchange skills. 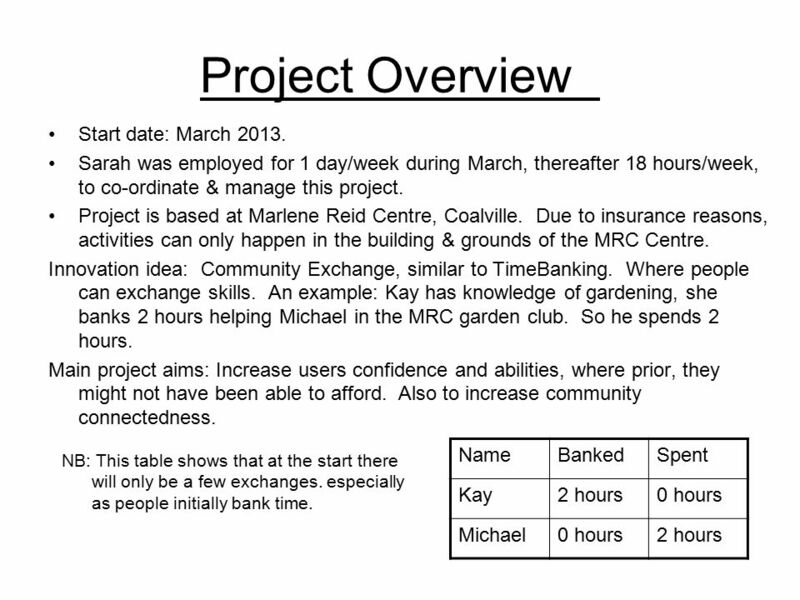 An example: Kay has knowledge of gardening, she banks 2 hours helping Michael in the MRC garden club. So he spends 2 hours. Main project aims: Increase users confidence and abilities, where prior, they might not have been able to afford. Also to increase community connectedness. NameBankedSpent Kay2 hours0 hours Michael0 hours2 hours NB: This table shows that at the start there will only be a few exchanges. especially as people initially bank time. 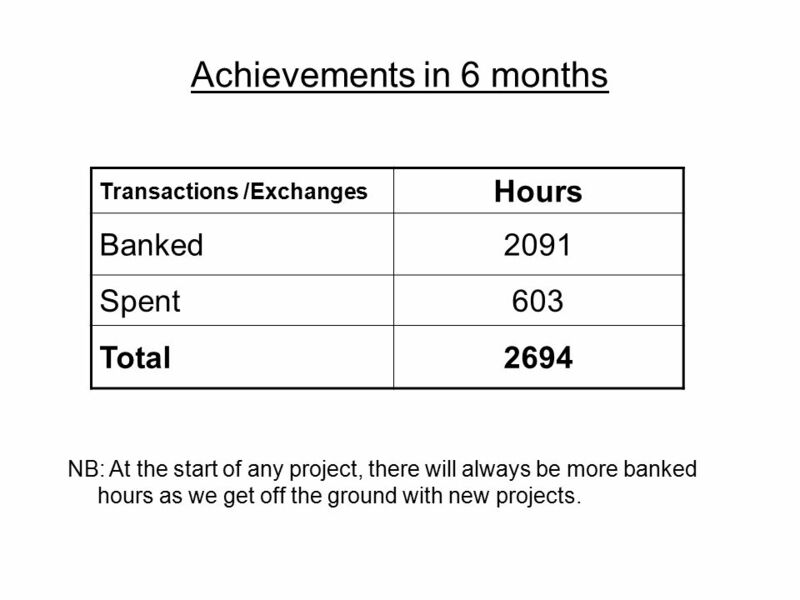 3 Achievements in 6 months Transactions /Exchanges Hours Banked2091 Spent603 Total2694 NB: At the start of any project, there will always be more banked hours as we get off the ground with new projects. 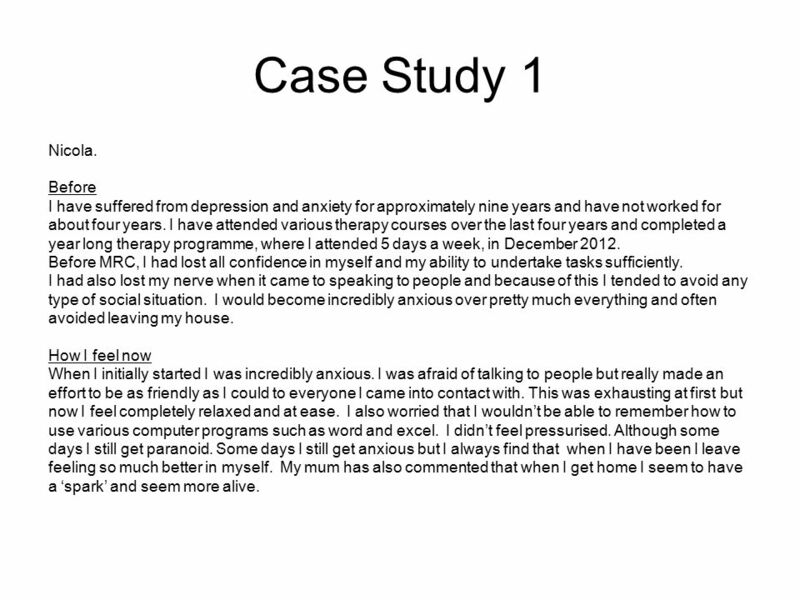 5 Case Study 1 Nicola. Before I have suffered from depression and anxiety for approximately nine years and have not worked for about four years. I have attended various therapy courses over the last four years and completed a year long therapy programme, where I attended 5 days a week, in December 2012. Before MRC, I had lost all confidence in myself and my ability to undertake tasks sufficiently. I had also lost my nerve when it came to speaking to people and because of this I tended to avoid any type of social situation. I would become incredibly anxious over pretty much everything and often avoided leaving my house. How I feel now When I initially started I was incredibly anxious. I was afraid of talking to people but really made an effort to be as friendly as I could to everyone I came into contact with. This was exhausting at first but now I feel completely relaxed and at ease. I also worried that I wouldn’t be able to remember how to use various computer programs such as word and excel. I didn’t feel pressurised. Although some days I still get paranoid. Some days I still get anxious but I always find that when I have been I leave feeling so much better in myself. My mum has also commented that when I get home I seem to have a ‘spark’ and seem more alive. 6 Case Study 2 Kay. Before MRC I struggled for a while with depression and anxiety, especially when I had a husband and two small children depending on me. I felt I couldn’t cope and overwhelmed by my emotions. I didn’t have much strength or self confidence. I wanted to help others and myself, but I didn’t know what to do. I also had financial worries. 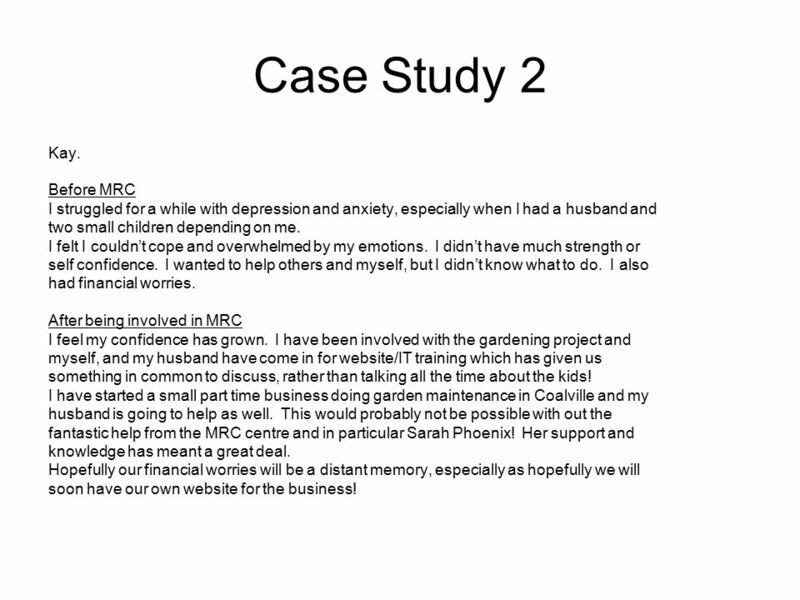 After being involved in MRC I feel my confidence has grown. 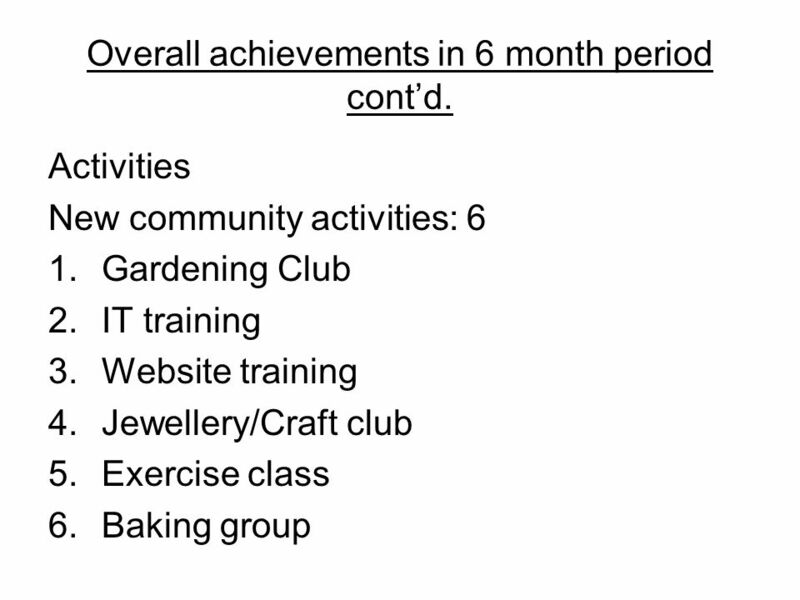 I have been involved with the gardening project and myself, and my husband have come in for website/IT training which has given us something in common to discuss, rather than talking all the time about the kids! I have started a small part time business doing garden maintenance in Coalville and my husband is going to help as well. This would probably not be possible with out the fantastic help from the MRC centre and in particular Sarah Phoenix! Her support and knowledge has meant a great deal. Hopefully our financial worries will be a distant memory, especially as hopefully we will soon have our own website for the business! 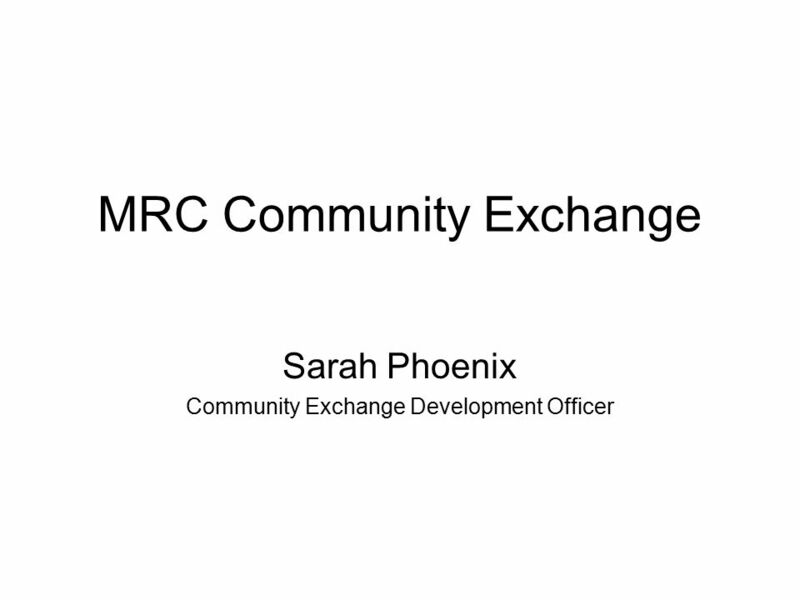 Download ppt "MRC Community Exchange Sarah Phoenix Community Exchange Development Officer." Grundtvig Learning Partnership. Athens Association of Alzheimer's Disease and Related Disorders Athens Association of Alzheimers Disease and Related Disorders. The Best Way Forward. : Inclusive Communities for Older People Hosted by Respond Housing Association, in association with Irish Centre for Social Gerontology. My time at the University of Cincinnati. What?? So What?? What will you do after graduating from this school? What would you like to do if you can do whatever you like? Good morning boys and girls! By Sarah Le Gros November – March 2011/12. Background: Work Based Action Research As part of the third year Social Science Degree, we were asked to work. Just the Job Our Half Way Event. Getting to know each other. USER INVOLVEMENT 2012/13 “It’s good to talk” Deborah Mosdall User Involvement Lead. For Autism in North Lanarkshire HOPE for Autism makes a positive difference to the lives of people affected by autism. HOPE for Autism. Changing Lives, Building Futures  Newid Bywydau, Creu Dyfodol MIXED AGE CLASSES The majority of schools in Caerphilly CBC have classes where the children’s. Living Well with Arthritis: A Self-Management Approach. 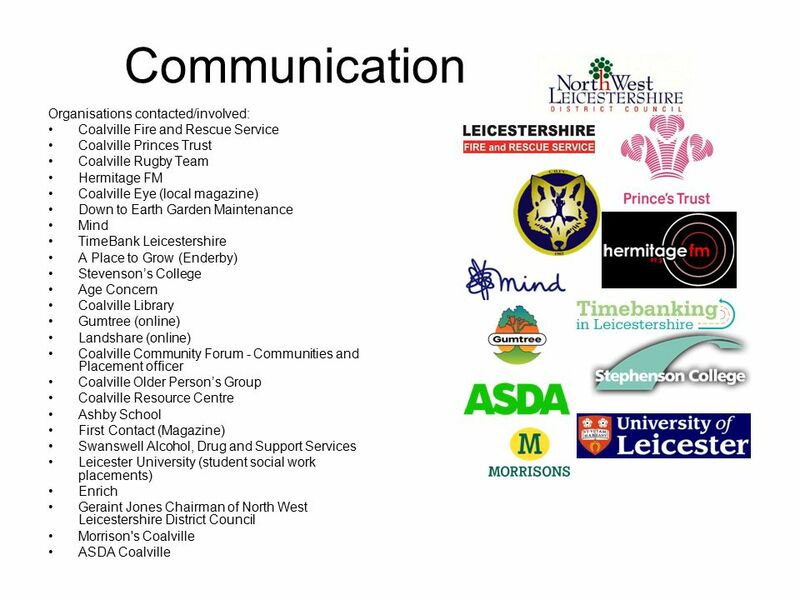 Lincolnshire Co-operative Society Apprenticeship Programmes.